For many people, moving to a new place comes out as one of life’s most stressful events. Especially, it can be more challenging for people to relocate a big residential or business property. Although it is cheaper to move on weekdays as compared to the weekend, still many people don’t want to waste much time away from the office/work. Also, moving during weekday can potentially disrupt their children’s school schedule. Moreover, there are fewer chances for them to get help from friends or family members on the weekday for packing and transportation of their households to a new house. Therefore, it is crucial for an individual to get help from an experienced Weekend Specialist Movers like CBD Movers who can offer him/her the professional and reliable Weekend Special Movers – Hire 4 Men and Two Trucks services for a stress-free move. As stated above, there is a difference in opinions amongst the various group of people. Some people believe that a weekday provides the best bang for the buck. While others swear that no one can beat the convenience of the weekend. Let’s have a look at our specialized Weekend Special Movers – Hire 4 Men and Two Trucks service that promises you best in class weekend removals services at a fair price of just $170 per hour. Why should you hire 4 Movers and Two Trucks services instead of 2 men and 1 Truck? Our Four Men & Two trucks option is specially designed for moving big residential homes with 3-5 bedrooms and large commercial offices. Each of the load of the 4.5-ton truck is specially designed for heavily furnished homes, large appliances, or large commercial goods and equipment. Here, we have illustrated three basic advantages that you can get on hiring 4 Movers and Two Trucks services as compared to 2 men and 1 Truck Service. Hiring 4 Movers and Two Trucks, comes with 2 extra movers and they can help you in speeding up loading and unloading process to make sure safe and efficient relocation of your belongings in the minimum possible time. So, it helps you minimize the per hour moving cost. On hiring 4 Movers & 2 Trucks, you will get more cubic space and load capacity (4.5+ 4.5 Ton= 9 ton) as compared to 2 Men and 1 truckload capacity of 8 ton. So, you can save big on moving an extra load of freight at a cheaper price. Our full-service weekend moving services of 4 Movers and Two Trucks are equipped with the protection of blanket and shrink wrap along with assembly and disassembly of household furniture that will ensure you smooth and safe moving of your big, heavy, and delicate furniture and belongings, without any risk of damage or product loss. If you are looking for reliable weekend removalists services in Australia then look no further! 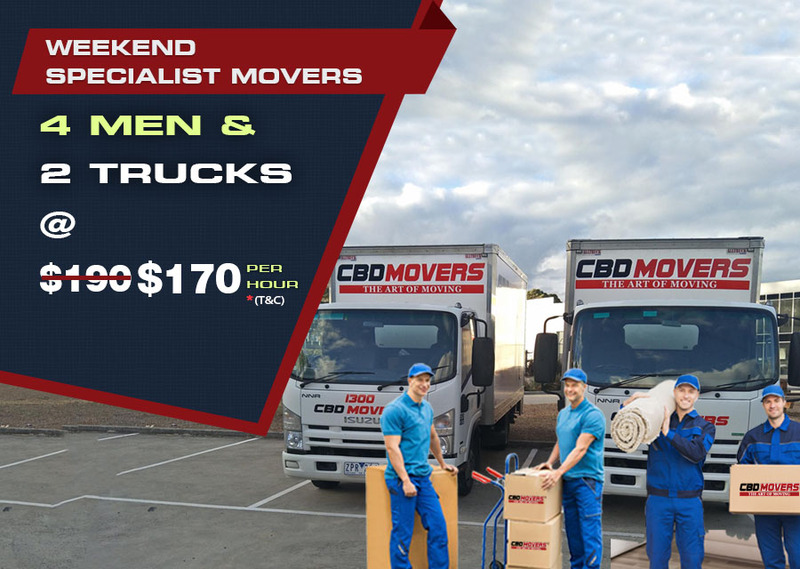 Just contact at CBD Movers, offering an exclusive Weekend Specialist Movers- 4 men and two trucks service at a discounted per hour price of $170 instead of an initial cost of $190. Two Fully Loaded (4.5+4.5 ton) Trucks. Timely Pickup & Drop at the destination. Equipped with protective blankets, shrink wrap, Dollies, tie-down straps, and Tools. For more information and any query feel free to contact us at 1300 223 668.